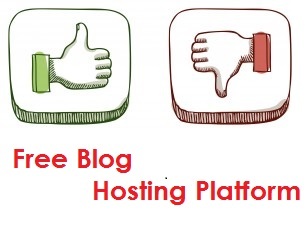 What’s not to love about a totally free blog hosting platform? There’s a reason platforms like WordPress and Blogger are so popular among amateur and even business bloggers. While there are a lot of truly wonderful aspects of having a totally free blog there can actually be some downsides, too. Here are a few pros and cons of going with a free blog hosting platform when it’s time to set up your space online. Of course, the obvious draw to free blog hosting sites is that they’re totally free. Depending on which site you go with you’ll have dozens of options and features to choose from but one thing’s for sure: you won’t be out hundreds or even thousands of dollars on a flashy website if your business goes belly up. Keep in mind that some free hosts offer levels of customization for a small fee to try and bridge the gap. Con: You get what you pay for.. Unfortunately, some blogs simply need more than free hosts can offer. For example, if you need a super-specific online shopping cart function on your site you’ll likely have to buy a custom WordPress template to get the job done right. Additionally, going with a free site means you aren’t going to get the level of personal service you would if you were a paying customer so you’re on your own when it comes to detailed troubleshooting. One of the best things about a free blog hosting platform like Blogger is that you can set up and launch a blog in a matter of hours. Forget waiting around for a developer to wire-frame your page or a designer to get back to you with font samples…it’s all ready to be chosen by you from a list of free options and setting up a simple blog is usually relatively easy. Although you may have to wait longer (and of course, pay more) for a professional to build your blog from scratch, you can rest assured you’re going to get exactly what you want. From the functionality to the overall look of the site, your blog will be totally customized and you can bet no other blog out there has the same theme. Originality may be worth the money to some bloggers. One of the best things about huge free hosting conglomerates is that they offer a ready-made network of other bloggers, tech support, and limitless opinions. It may be easier in the first few months after launch to build up an audience simply by tapping into the free host’s budding network of readers. Perhaps the scariest thing about hosting your blog on a free site is that none of your content, photos, or even the domain itself actually belongs to you if it goes through the host. Say WordPress shuts down one day; although highly unlikely, your blog and everything on it could vanish in an instant. When you host your blog yourself or pay for hosting on a reliable server you have more legal rights to your content per your contract. Whether you pay to host your blog or decide to go the free route will greatly depend on your needs. If you want a full-scale enterprise site that can handle transactions as well as route content to social media you may be best-suited shelling out for a custom hosted site. If you simply want to post long-form articles about housecats, you’re probably fine going free. Author Bio – Ryan Currie is a product manager at BizShark.com, with 5 years experience in online marketing and product development. In addition to web related businesses, he also enjoys the latest news and information on emerging technologies and open source projects. Hi good tips, I’d like to add one more tips, its FREE, people become a lazy seeing any hopes from the blog. Coz people try to make a big blog and earn more by the blog and start it and when they see a lot of hard work needed (even it is free), they stop blogging. Thanks for your thoughts @Naveen. Good tips but i’d prefer paying hosting rather than free hosting. blogging is literally got more hard work, patience, consistency. free hosting can damage your hard work any time. and you can’t earn for long time with free hosting.